http://www.JewishWorldReview.com | Nearly 1,000 days stretch between this Presidents' Day and the next presidential election. Yet already it is impossible to escape the maneuvers, machinations, and media coverage of men and women so consumed with winning the highest office in the land that the lust for power all but oozes from their pores. For as long as most of us can remember, the obsessive quest for the presidency has been an indelible feature of American politics. Try to envision a successful candidate for the White House who doesn't have that "fire in the belly": a candidate prepared to accept the job if it seeks him out, but not driven by such insatiable ambition that everything else pales by comparison. It would be easier to envision a team of unicorns. And yet America once had such a president. He was James A. Garfield of Ohio, a remarkable individual who rose from grinding poverty to the presidency of the United States without ever thrusting himself forward as a candidate for election to anything. It is a shame that Americans don't know more about this gifted yet modest leader, as they doubtless would had he not been fatally shot by an assassin just four months after becoming president. On the eve of Garfield's inauguration as the nation's 20th chief executive, he told a group of old friends: "This honor comes to me unsought. I have never had the presidential fever, not even for a day." It was true. At every step of his political career, Garfield had to be urged to serve for the good of the country. He was first elected to Congress during the Civil War in 1862, while he was on active duty as a major general in the Union Army. The 31-year-old Garfield, a Republican and ardent abolitionist, "receiv[ed] nearly twice as many votes as his opponent, although he had done nothing to promote his candidacy," writes Candice Millard in Destiny of the Republic, her 2011 history of Garfield's election and tragic death. He didn't take his congressional seat for another year  and then only because President Lincoln pressed him to do so. "I have resigned my place in the army and have taken my seat in Congress," Garfield wrote in a letter home. "I did this with regret � [b]ut the President told me he dared not risk a single vote in the House." A competent lawmaker with a reputation for conciliation, Garfield served nine terms in the House, before being elected to the US Senate in 1880. It was as Ohio's senator-elect that he arrived at the Republican National Convention in Chicago that June. He had come to serve as floor manager for Treasury Secretary (and fellow Ohioan) John Sherman in what was expected to be a three-way fight for the GOP nomination. The other leading contenders were former President Ulysses S. Grant and US Senator James G. Blaine of Maine. But none of the three could win the 379 votes needed for nomination. As the convention remained deadlocked through ballot after ballot, some delegates began floating Garfield's name as a compromise. On the 34th ballot, after a day and a half of voting, 17 votes were unexpectedly cast for Garfield. Dumbfounded, he rose to protest, objecting vehemently to any effort to nominate him. "The announcement contains votes for me," said Garfield, who had remained loyal to Sherman throughout the proceedings. "No man has a right, without the consent of the person voted for, to announce that person's name and vote for him in this convention. 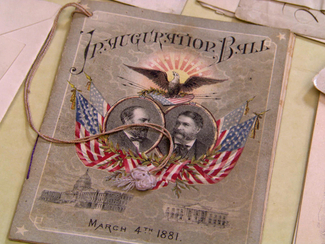 Such consent I have not given"
Official program from the March 4, 1881 inauguration of President James Garfield and Vice President Chester Arthur. Before he could finish, the convention chairman  Massachusetts Senator George F. Hoar, who had privately hoped all along that the party would unite behind Garfield gaveled him out of order. The polling continued. On the 35th ballot, there were 50 votes for Garfield. By the 36th, with even Sherman throwing his support to his ally, it was all over. Garfield was nominated with 399 votes. As the convention erupted in cheers and song, a "shocked and sickened" Garfield was beset by well-wishers. To one delegate's congratulations, he replied: "I am very sorry that this has become necessary." Five months later, he was elected president. On March 4, 1881, he was sworn in, and delivered an inaugural address passionate in its emphasis on the rights of freed blacks. "Former slaves in the crowd openly wept," Millard recounts. Many more Americans would weep six months later, when Garfield died of the gunshot wound he had received on July 2, 1881. "I suppose I am morbidly sensitive about any reference to my own achievements," the 20th president once acknowledged. "I so much despise a man who blows his own horn, that I go to the other extreme." Not many presidents have been more suited for high office than this admirable man who never lusted for power. Would that his like were in the mix for 2016.